Made popular by its appearance in the fan-fav Harry Potter series, the horrifying creature known as the Basilisk was said to be the bane of Europe during the Middle Ages and has been held responsible for an untold number of deaths. According to legend, there are two species of this horrific creature. The first variety was capable of burning everything it approached – the second was known for its ability to slay an opponent with nothing more than a glance. Both species were said to exude fumes which were so noxious and infested with pestilence that their breath alone could wilt vegetation and even disintegrate stone. It was even commonly believed that if a man on horseback should try to slay a Basilisk with a spear, the potency of its toxic breath would envelope and kill not only the rider, but his horse as well. Illustrating this assumption is the story of a Basilisk (referred to in this account as the Cockatrice) which was reportedly discovered in a Roman vault in the chapel of Saint Lucea during the time of Pope Leo the 4th, somewhere between 847 and 855 AD. Although the details surrounding this story are few, it was said that the vile breath of the Basilisk so fouled the air that numerous deaths were attributed to the beast. 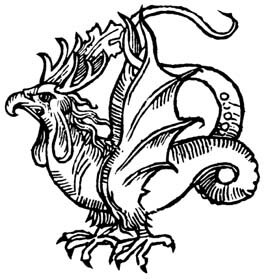 Legend has it that the Basilisk is spawned from a spherical, yolkless egg, which must be laid during the waning days of the Dog Star Sirius by a 7 year-old rooster. The egg, once abandoned by its mother, must then be hatched by nothing less than a common toad. 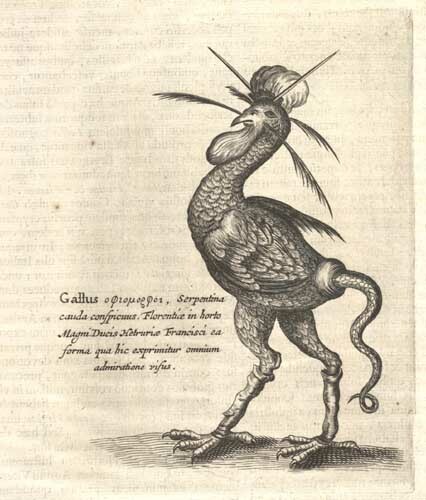 Given that description of the creature’s reproductive process, it would seem that the Basilisk – or Cockatrice – is a creature whose roots are locked firmly to a world where a fertile imagination takes precedence over scientific observation. Reports of the creature’s physical attributes and appearance are no less taxing on the rational mind. Described as having the head of a rooster and the body of a snake, the Basilisk is a creature that most definitely meets the criteria of a Hybrid-Beast. Other reports of the creature describe it as having eight legs or the feet of a fowl. Some have even claimed that the animal bears the wings of a bat. In fact, this creature was considered to be so horrible in appearance that a mere glimpse of its visage would cause death not only in its potential victims, but to the creature itself, that is if it were unfortunate enough to be exposed to its own reflection. As unconquerable as the Basilisk may seem, reports state that there was a fairly simple way to kill the beast. Much like the cobra fears the mongoose, the Basilisk is said to have fallen victim more than once to its own deadly nemesis… the weasel. The sound of a rooster crowing was also said to cause a fatal reaction in the creature. Whether the Basilisk was a genuine animal, which has long since become extinct, or the product of fertile, Dark Age imaginations, the fact remains that this enduring legend still has a deep (and oft times frightening) resonance to this very day.